The British formulate a campaign to end the rebellion. General John Burgoyne's army is ordered south from Canada. his objective was Fort Ticonderoga and from there, Albany, and a rendezvous with British forces coming from New York City. North of Albany stood an American army, blocking further progress in a strong defensive position on Bemis Heights. Burgoyne was determined to attack and reach Albany, unaware that Howe's army was not moving north to meet him. On his own initiative he, and most of his army, had sailed for Pennsylvania. On the American side, command dissention reigned. Benedict Arnold defied Gates' order to remain on the defensive, and sallied forth to meet the British in the woods where their artillery would be of little use. The fighting at Freeman's Farm would be savage. Here no farmer's militia, but rather Continental Regulars stood toe to toe with Europe's finest. The sanguinary nature of the fighting was summed up best by American Brigadier General John Glover, who said, "Both sides seemed determined to conquer or die." General George Washington, holding interior lines at Morristown, New Jersey, was unsure whether Howe would move north in support of the British invasion from Canada, or whether he would move south against the Capital. Once the armada set sail southward, Washington shifted southwest and took up a naturally strong defensive position on the high ground behind Brandywine Creek, astride the main road to Philadelphia. Washington posted his troops advantageously and in depth. Control of the fords of the Brandywine would be key to his position, and although a possible flank attack was discussed, it's likelihood was discounted on the strength of local information. With some 14,000 troops, including crack German mercenaries, and elite American Loyalist units, Howe's British army was about to execute a flanking manoeuvre of "Jacksonian" proportions. Guilford Courthouse. British General Cornwallis' veteran army was dwindling daily due to lack of supply. He was gambling on local Tory support and sought a battle of annihilation to crush the Americans before his own forces withered away. Greene also sought a major battle. His army was as strong as it was ever likely to be, but he was painfully aware that the nearly 3,000 militia in his ranks could not be relied on to stay. Each commander hoped to deliver the coup de grace. The Battle of Eutaw Springs was noteworthy for a number of reasons: the parity of the opposing forces, the fierce quality of the fighting, and the fact that the American militia and partisans under Francis Marion (The Swamp Fox) fought in a set-piece fashion and held their own. 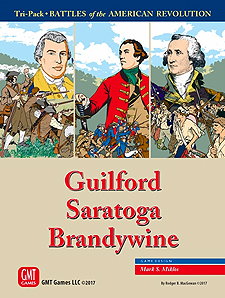 Like Guilford, the battle was considered a British victory, but the British withdrew to Charleston never to emerge again.